Taking a tour to the Nowa Huta district, Krakow 's famous communist enclave, was a strange experience for me. As I could understand, the life under the communism was really absurd. Nowa Huta was originally a gift from Stalin. This working-class quarter boasts some great "grey" communist architecture. Its also still bears testament to the power of the Soviets. Photo. 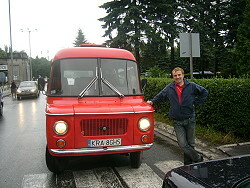 Driving a car (bus) from the communist time, Nowa Huta, Krakow, in Poland. © Travel Explorations. Driving in an authentic car from the communist time was real fun. It was possible for me to choose between the Soviet Volga and the Polish working-class Nysa. I decided to go to Nysa, and there on a previously small air stripe for airplanes, my guide let me drive the car for some minutes. To say it in another way: it was like travel back in time. These faces are expressed through historical differences and types of architectures in the city. When it comes to Nowa Huta, the life under the communist rule was full of absurdities. The Communist propaganda didn’t live up to its promises and made the life difficult for people. Grey huge blocks were not even a pretty sight. On my tour I got insight how life was like under the communist system. My guide told me many fascinating stories about life there in the past. As Krakow Planet (www.cracowplanet.com) describes the past in Nowa Huta: Can you imagine sharing your bathroom with a fish for a week? Or standing ten hours in a cue to buy a toilet paper? Or simply waiting in front of a closed shop till 1 p.m., with a terrible hangover, before you could buy a beer? After the Second World War, Poland was one of the communist countries, where terror and sorrow was mixed with the comic and an absurd situation. 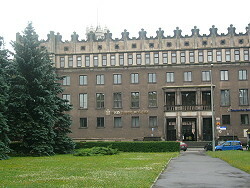 Nowa Huta was founded in 1949 and become centre of Poland's first integrated steelworks. The town was once as a communist paradise, and at the same time a fortress, prepared to defend its citizens in case of an attack on the Soviet Bloc from the West. Nowa Huta was built as the model socialist city, entirely planned out as a model way of life under socialism. It even came equipped with its own steel works and houses for the working population. Ironically it was Nowa Huta that was one of the centers of dissent during the collapse of socialism and the eventual withdrawal of Russia from Poland. Photo. Outside the gargantuan 'Lenin Steelworks'. Nowa Huta literally means 'New Steelworks. 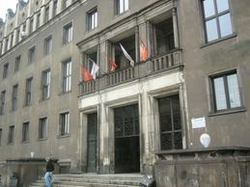 The unique architecture was a product of the 'doctrine of socialist realism'. Experience a centrally-planned Socialist city, complete with steel works and tenement houses built in the Renaissance style of the Soviets. This unique district was meant to be a model communist city, but later came to be one of the centres of revolution and resistance within Poland, leading to the eventual overthrow of the Communist government. Photo. On the Entrance Gate to Metal Steelworks formerly of the name of Lenin. Here I drove along divisions of Steelworks. © Travel Explorations. Nowa Huta was one of only two Soviet 'ideal cities' ever to be built. On my tour I was shown the famous sites related to the communist past in Poland. 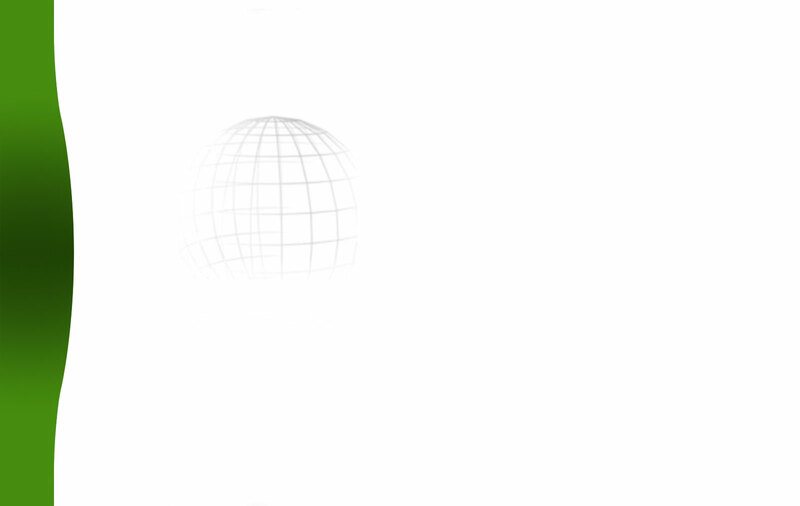 Here I could observe grey blocks for inhabitants, modern houses and squares created according to Leonardo da Vinci plans. Especially I admired the size of the Steelworks Complex and the beautiful Arka Church, which is the symbol of freedom. It was also possible to experience the taste of Vodka in a authentic communist pub and eat herring on a tour to this part of Krakow. Read more about Krakow and Poland on our global travelguide www.TravelExplorations.com.